What is a vehicle movement (Conveyance)? A vehicle movement is the transfer by road of a vehicle between two locations (From point A to B) specified by the customer when ordering. It is neither a transport of material nor a transport of persons. Fullcar Services can carry out a vehicle movement for you either in isolation or upstream or downstream of other modes of transport (train, truck, etc. ), over short or long distances. The vehicle is driven by a uniformed and trained professional car driver. When the vehicle is collected, a delivery note is established contradictorily between the Customer-transferor and the car driver. Until the same delivery note is signed by the recipient, the vehicle is placed under the responsibility of Fullcar Services by Feedback. As an option, you can order additional services such as pre-delivery washing, top-up or refueling. By whom is the vehicle movement carried out? Our vehicles movements are carried out by Fullcar Services personnel specially trained for these missions. How's the vehicle collection going? When the vehicle is collected, a vehicle movement voucher available on an "e-check" mobile web application is established contradictorily between the Customer-transferor and the car driver. This electronic document is kept by a third party, in addition to indicating the characteristics of the vehicle (make, model, registration, etc.) and of the vehicle movement ( collection, destination, etc. ), making it possible to check the internal and external condition of the vehicle. Until the same vehicle movement voucher is signed by the recipient, the vehicle will be placed under the responsibility of Fullcar Services by Feedback. How is the delivery of the vehicle? At the time of delivery of the vehicle, a delivery voucher available on mobile web application "e-check" is established contradictorily between the car driver and the Customer who receives the vehicle. This electronic document, kept by a third party, in addition to indicating the characteristics of the vehicle (make, model, registration,...) and of the delivery (collection, destination,...), makes it possible to record the internal and external condition of the vehicle in order to identify the responsibilities of each party in the event of a dispute. What does the price of the service include? The price of the vehicle movement is defined after having requested an online quotation. The price includes the transfer of the vehicle between two locations indicated by the customer when ordering and any possible options ordered. The price also includes the travel time of a car driver to drive a vehicle by road from its place of collection to its place of destination, the return of the car driver to its home, the costs of insurance of the vehicle in the event of damage, theft and fire, road costs (tolls, fuel,...) as well as any travel expenses of the car driver (catering, hotel) in accordance with regulations in force. Is it possible to cancel a vehicle movement? For any information, the Fullcar Services by Feedback teams are at your disposal from Monday to Friday from 9am to 6pm on +33 1 41 49 05 45 or by e-mail at e-convoyage@fullcar-services.com. How can I follow the transfer of my vehicle? The client receives an automatic e-mail at the beginning and end of the mission. Depending on your needs, the Fullcar Services team can send you information at each stage of the mission. You can check the status of the shipment at any time in "my e-convoyage". How can I modify the transfer of my vehicle once the order has been validated? For a minor modification (ex: modification of an option, contact details of the person to contact), you can directly indicate it to the e-convoyage team, 24 working hours at the latest before the vehicle movement, via the correspondence module by clicking on the vehicle movement in question (in "MY E-CONVOYAGES"). At the bottom of the page, in "Correspondence with Fullcar Services", specify your requests. For a change of route, you must cancel your order (depending on conditions) and register a new vehicle movement. Is it possible to contact the car driver directly? Fullcar Services is in permanent contact with all its car drivers. If necessary, you can contact the Fullcar Services Operational team who will put you in direct contact with the car driver if necessary. Fullcar Services is the exclusive automotive services department of Feedback. Founded in 1998, Feedback now employs 1000 people in the field. Feedback is specialized in business services through its 3 entities (for more information: http://www.feedback-entreprise.fr). Each year, Fullcar Services carries out more than 600,000 short and long-distance vehicle movements throughout France. What is the minimum time to order a car driver? We can carry out your vehicle movement requests anywhere in France within an average of 48 working hours or even 24 hours if you select the "Express" option. We are not bound to the impossible but will nevertheless do everything possible for even shorter deadlines. In this case you can contact directly our Operational team from Monday to Friday from 9am to 6pm on +33 1 41 49 05 45. What are the advantages of the mixed rail-road solution? Our partnership with SNCF's Auto Train service enables Fullcar Services by Feedback to offer you a multimodal road + door-to-door train service. This very economical offer also has the advantage of limiting the number of kilometres driven, greatly reducing CO2* consumption and often being faster. How does the Mixed Rail-Highway vehicle movement work? 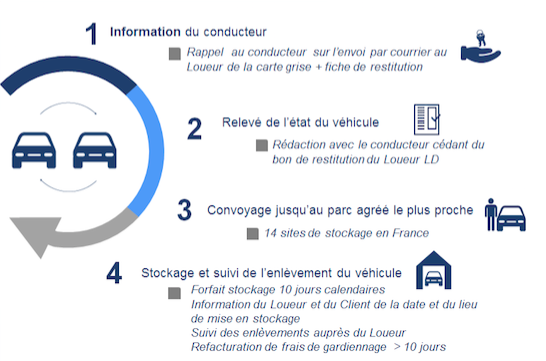 After having verified that the vehicle to be transported complies with rail transport conditions (overall height, width, box height) and that the destination is compatible with one of the 13 Car Train stations in France*, e-convoyage offers you a boarding date and the associated price (delivery and train). We then take care of the reservation of the Auto Train ticket** as well as the vehicle movement upstream and downstream of the vehicle by our car drivers. How does a Fullcar Restitution work? After having ordered your vehicle movement, a new screen appears in e-convoyage asking you if you wish to add a restitution to your order, either at the address of your choice or towards one of our approved tank farms while waiting for the Renter Long Duration, owner of the vehicle, comes to recover it. Fullcar Free Restitution: Simply indicate the place of destination, make, model and registration of the vehicle returned. Where can I find my quotation? On "My e-convoyage" page, you will find all your saved quotes, your current orders, the history of the shipments made. Address Book: How do I save or change my recurring delivery and/or pick-up addresses? How do I get access to e-convoyage? e-convoyage is an interface for ordering and managing online vehicles movements restricted to companies. To obtain access, you must connect to e-convoyage.fr and complete the online registration form. Have you noticed any abnormal functioning? Despite all the care we take daily in the design of the site, small bugs may remain. If you notice any malfunction, do not hesitate to report it to us with as much detail as possible on the problem encountered. What e-convoyage prize did it win? Fullcar Services e-convoyage wins second place in the Automotive and Enterprise Trophies in the Sustainable Mobility category. The original e-convoyage solution for multimodal door-to-door vehicle transfers won over the jury of specialist journalists and fleet managers. e-convoyage offers short and long distance vehicle movement solutions in France. In a few clicks, the fleet manager obtains a comparative estimate of three types of car drivers. Then he can manage, book and follow up online. Would you like to share your ideas to improve the site? The whole team will be happy to take note of your ideas. We work daily to improve the tool. Send us your suggestions by e-mail to e-convoyage@fullcar-services.com or by phone +33 1 41 49 05 45.